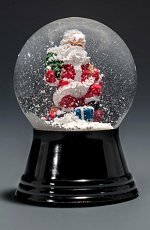 Original 45mm Viennese Snow Globes made in Austria. contained snow made from ground rice. days of non-freezing weather! We will process & hold your order! 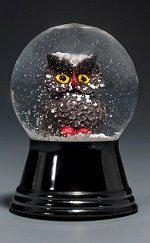 This is a genuine Viennese blown glass snow globe with a small Woodlands Owl inside. Made in Vienna, Austria by the original Viennese Snowglobe Manufacturer, Erwin Perzy III, since 1900. 1-3/4 Inch Diameter - 2-3/4 inches height Ø 4,5 cm - height 12,5 cm Weight: 2.8 ozs - 80 g Black deco plastic base. Not suitable for children under 6 years of age. 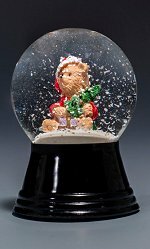 This is a genuine Viennese blown glass snow globe with a small Teddy Bear decked out in Santa attire inside. Made in Vienna, Austria by the original Viennese Snowglobe Manufacturer, Erwin Perzy III, since 1900. 1-3/4 Inch Diameter - 2-3/4 inches height Ø 4,5 cm - height 12,5 cm Weight: 2.8 ozs - 80 g Black deco plastic base. Not suitable for children under 6 years of age. 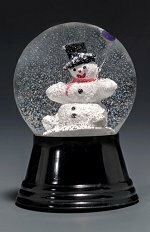 This is a genuine Viennese blown glass snow globe with a small snowman holding a balloon inside. Made in Vienna, Austria by the original Viennese Snowglobe Manufacturer, Erwin Perzy III, since 1900. 1-3/4 Inch Diameter - 2-3/4 inches height Ø 4,5 cm - height 12,5 cm Weight: 2.8 ozs / 80 g Black Deco plastic base. Not suitable for children under 6 years of age. 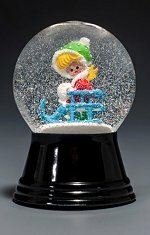 This is a genuine Viennese blown glass snow globe with a small girl riding a sled inside. Made in Vienna, Austria by the original Viennese Snowglobe Manufacturer, Erwin Perzy III, since 1900. 1-3/4 Inch Diameter - 2-3/4 inches height Ø 4,5 cm - height 12,5 cm Weight: 2.8 ozs - 80 g Black deco plastic base. Not suitable for children under 6 years of age.